A group of 250 Yankees fans showed their support for public breastfeeding on Tuesday night while watching their favorite ball team on the field. The Bronx Breastfeeding Coalition organized the outing at Yankee Stadium, which they called “Breastfeeding Night with the New York Yankees.” This was the third annual event of its kind, where nursing moms and their supporters were encouraged to enjoy a game while breastfeeding their babies, in an effort to raise awareness and normalize the act of nursing in public (commonly abbreviated as NIP among nursing moms). The group included 60 nursing moms, all with babies and toddlers in tow, as well as other family members and supporters. 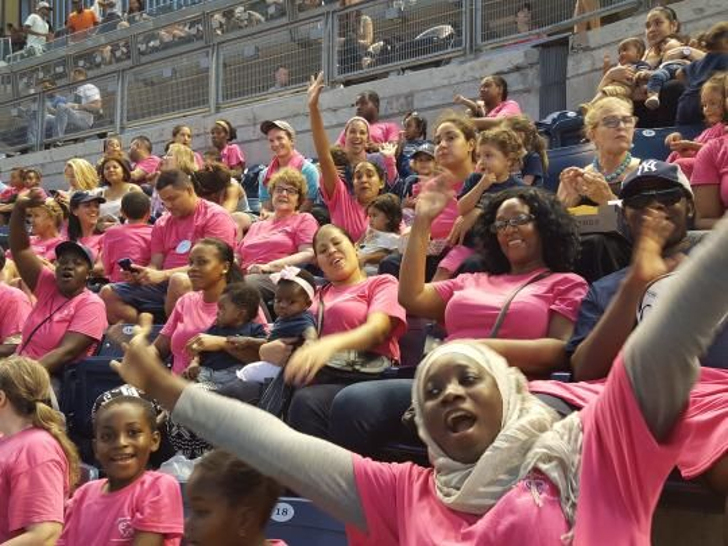 The mothers donned hot pink T-shirts that said “The Bronx Breastfeeds.” Meanwhile, babies and toddlers got navy T-shirts that proudly proclaim, “I breastfed at Yankee Stadium” across the front. For many in the group, this event was the first time they nursed in public and didn’t feel self-conscious or uncomfortable about it. The Yankees triumphed that night (8-4 against the Minnesota Twins) but the game was a big win for breastfeeding moms and babies as well. Bronx Breastfeeding Coalition organizes an annual "Breastfeeding with the NY Yankees" night to normalize nursing in public.